Atomic Floyd Twist Jax review | What Hi-Fi? For some people, trying to fit in-ear headphones into their lugholes can be an awkward and painful experience. Atomic Floyd's Twist Jax offer a solution that's hinted at in the model name. 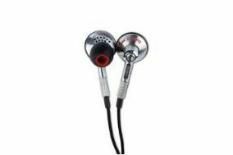 The earbuds can rotate on their fittings (it's referred to as Twist2Fit technology), thus eliminating the need for any over elaborate contorting in your ear canal. Once in place, the Twist Jax fit extremely snugly and the design is certainly befitting of a pair of premium headphones. They're weighty in hand and the metallic earpieces look exquisitely engineered. The sturdy fabric cable is another hint that these headphones are built to last. In the packaging you get a neat little carrying pouch, an airplane adaptor and a 3.5mm – 6.3mm headphone adaptor too. Hook them up to an MP3 player and you're hit with an energetic, upfront sound. The ‘phones present music a very open and clear manner. Detail levels and bass weight are good for the money too. However, it soon becomes apparent that the Twist Jax can't break out of their forward musical stance. The longer you listen, the more tiresome this one-dimensional, relentless approach becomes. High frequencies sound splashy and vocals can sound hard and unnatural. Atomic Floyd have got the feel and fit right but there are too many sonic frailties on show, especially for this kind of money.